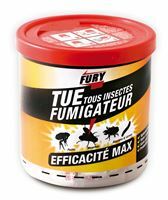 The Fury insectiside range is intended to be complete with a product targeted by nuisance. Insecticide formulations from the Fury range are designed for maximum efficiency while ensuring maximum safety for users. 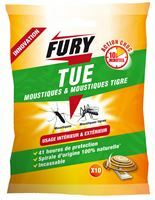 The Fury line is made in France and covers different areas of fight against insects. 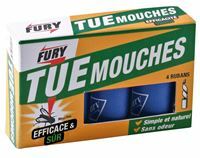 For the fight against flies, Fury offers fly catch ribbon which remains a visually uncompromising solution but remains a true reference in terms of efficiency. The ribbon is now available in adhesive strips that can be placed more discreetly. The fly swatter which is a traditional instrument presents the interest of not calling on any chemical action with an unbeatable cost. Granules based on an active ingredient that acts quickly by contact and ingestion is odorless and easy to use. Its impact on the environment is also limited. 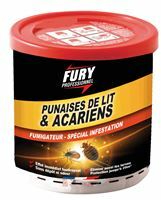 Fury also offers insectisid fumigants for curative treatment of premises with two sizes corresponding to two volumes. This method makes it possible to reach the most inaccessible places for a total treatment. The Smoke Fury offers a broad spectrum of action: active on mites, fleas, cockroaches, cockroaches, mites, bugs and flying insects. It has a powerful penetrating effect to act on eggs and larvae. The fight against mosquitoes can be complicated especially in the case of significant presence. Beyond the risk that some species such as the tiger mosquito can present, it is the gene and the discomfort that is important to tackle the fight against mosquitoes in a professional manner. First of all, we must favor the fight at the source by avoiding all stagnant water sources sources of larvae development and eggs. Then, there are solutions with insect destroyers with electrified grids, for outdoor CO2 emitting devices such as mosquito Magnet and traditional solutions proposed by Fury. 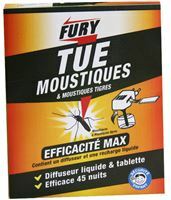 Fury offers electric diffusers with refills in tablet or liquid but also the spiral anti mosquito whose support of combustion is 100% natural.